[Faulkner State Community College] student Amanda Scott addressed the commission first, advocating a different phrase instead of the proposed religious motto. 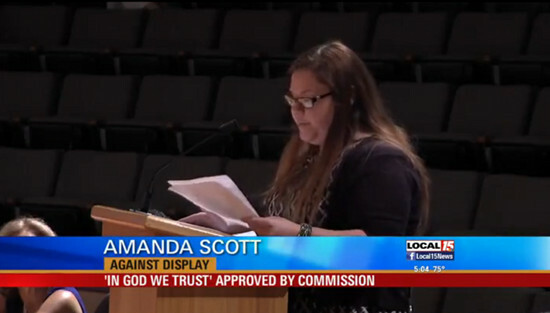 “I strongly urge the commission to reject the display ‘In God We Trust,” she said. “It would only serve to divide Mobile on religion when we’re already so divided on other issues,” she added. Scott proposed the Latin phrase “E pluribus unum,” meaning “out of many, one,” or “one of many.” She declared herself as an atheist and said the proposed display would exclude her in others in the public building. Unfortunately, it didn’t matter. Two of the commissioners — President Connie Hudson and Jerry Carl — voted to move forward with the plaque. … Pagans, Universalists and atheists want to propose their own privately-funded displays. The Mobile Atheist Community would like to see a display that reads “in reason we trust,” Universalists want one that says “coexist” and Pagans are lobbying for “in Goddess/es we trust,” according to the organizers. The displays would likely be on plaques. Representatives from all three groups will attend the Commission’s meeting today to discuss their options. Let the fireworks begin. If the Commission rejects their pleas, it’s possible they would be on the receiving end of a lawsuit.